Benilux Park Hotel is a 3 star hotel which is located within easy walking distance of the beach. The hotel is only 100 yards from the beach, offering top class watersports & fantastic swimming waters. All 216 bedrooms are equipped with television, air conditioning and telephone. The hotel has a swimming pool whilst the bar and restaurant offer a selection of local cuisine. Hotel Benilux Park has easy access to the city's attractions and the airport. 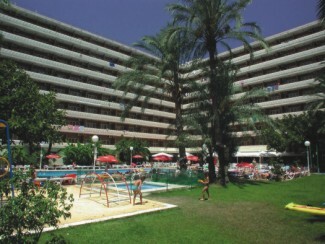 This hotel is suitable for families and couples who want a quality hotel in Benidorm. Each week, there is a gala dinner with special menu items included in you food selection. "We Liked The Benilux Park"
The hotel is really nice and clean. The room we were allocated overlooked the pool. The hotel did seem to be popular with the older Spanish people and they can be a tad loud when they are all talking at once. The food overall was good with a reasonable choice, we actually only ate breakfast and lunch as we prefer to go out on a evening. We liked the Benilux Park and think it is a good hotel. We would recommend it to people who prefer to be away from the night life.